ROKEPIE is a bioregulator to preserve cells and tissues at 2-8°C. There are other preservation media who claim to do the same as ROKEPIE but these solutions do not support living cells and tissues or are even toxic. What makes ROKEPIE unique is that it is a non-toxic additive which you can simply add to your tissues and cells. Cryopreservation alternative, effective cell storage and transportation at temperatures of 2°-8°C. Wouldn’t it be great to skip the freezing and dry ice while still protecting your cells? It’s non-toxic, where other preservation solutions are toxic ROKEPIE is cell-friendly so there is no need for changing the culture medium after hypothermia. Forget about cell-stress or extensive cell loss. Pause cell growth, control cell growth in a specific period which gives you the freedom to control cell culture development. It’s easy to use, no need to use DMSO or change the medium before and after cold storage. Just add, incubate, store and rewarm without washing. Fully synthetic, no animal components, antibiotics and preservative. It’s also one defined, small molecule. 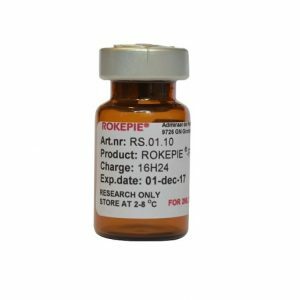 Shelf-life of 3 years, ROKEPIE will be delivered as a freeze-dried formulation which can be used to make 50-200ml cell culture medium. Hypothermia is a well know protection principle for the storage and transport of cells. It slows down cell metabolism and reduces damaging processes caused by lack of oxygen or substrate. Something like when animals hibernate. Unfortunately this cold can cause damage to the stored cells and that is where ROKEPIE comes in. With adding ROKEPIE to cells and tissues they are prevented from such damages which will lead to significant longer period of cold storage. Can you imagine what this can mean for you? An extension of the transportation time which is ideal for international destinations but also a longer storage time so you can pause the cells during production or development activities. It also supports cell growth upon rewarming at 37°C which makes ROKEPIE the first choice for researchers, physicians and scientist all over the world. And did we mention the 3 year shelf-life of our formulation? ROKEPIE will be delivered in freeze-dried formulation and can be stored for approx. 3 years. Cryogenic preservation is the current golden standard for long-term cell storage but it has some drawbacks such as limited storage capacity due to the use of specialised equipment, use of toxic cryoprotective agents, complicated protocols and relatively high cost. Slow freezing generally yields over 90 % viability post-thaw but not all cells respond that well to cryogenic preservation. For example, poor survival of cryopreserved human embryonic stem cells (hESC) grown as colonies has been reported and a study showed negative temperatures compromise the functionality of human hepatocytes as cells lose their adherence capabilities and exhibit an altered metabolic profile post-thaw. Additional problems with cryopreservation may include cell damage from intra and extracellular ice formation and cell dehydration, induction of apoptosis upon thawing by osmotic imbalance caused injury and the use of animal derived components, such as fetal bovine serum, may introduce contamination in the samples. Finally, dimethyl sulfoxide (DMSO) is the most widely used cryoprotective agent and in the same time represents one of the main problems with cryogenic storage. There are three main reasons for that- at ambient temperatures it is toxic to cells, may induce cell differentiation and patients treated with DMSO-preserved cells can experience adverse reactions. Therefore a large portion of the cryogenic research is devoted to finding new safer protective agents which we can offer in the form of ROKEPIE. ROKEPIE allows you to access all benefits of hypothermic preservation while avoiding all the negative effects that cryopreservation could have on cells and tissues. It’s the most practical and cost efficient way for transportation and storage. Source image: Robinson NJ, Picken A, Coopman K. Low temperature cell pausing: an alternative short-term preservation method for use in cell therapies including stem cell applications. Biotechnol. Lett. 2014; 36: 201–209. The field of short-term cell biopreservation is still developing. The term cell pausing was introduced in 2013 (in many ways is similar to cell hibernation) as main aim of hypothermic preservation. It outlines the necessity of short-term hypothermic preservation and the viability of using hypothermic temperatures to store cells. In short, the main advantage of hypothermic preservation is that it offers a simplified process of biopreservation. Pausing cells at ambient or temperatures maintained by the widely available refrigeration equipment (2-6°C) reduces storage and transportation costs significantly. In addition there is no need for expensive specialised storage equipment which further reduces the costs and also allows the storage and transport of cells on a larger scale. Cryopreservation limits the transport capacity as most cryovials and cryobags store between 1–20×106 cells/ml. Hypothermic preservation effectively bypasses this restriction as cells can be stored in larger containers. Interestingly storing large numbers of cells in suspension decreases the effects of low temperatures thus increasing the chances of cell survival. Hypothermic preservation is less harmful than cryopreservation due to the absence of drastic temperature change. In this way cell damage from ice nucleation and osmolarity changes are avoided. What does ROKEPIE do for cells and tissues?